It's unclear whether Noguchi considered this model for a large scale earthwork sculpture to be considered metaphorically or as an actual proposal. The story is that he'd seen an aerial photograph of a bombed area in North Africa and was struck by the incredible malleability of the earth as a medium for three dimensional sculptural exploration. From the title and his comment regarding the "tragedy of war, it seems clear he saw this approach as an opportunity to make a statement about the destructiveness of war. His rendering of the earth as a tortured surface suggests a living being that's been torn, damaged, and deformed as a human body might be following torture. It seems to draw upon the analogy common to many world cultures of the idea of the earth as a mother, as a source of life and regeneration. Noguchi explored these themes throughout his career in representational, symbolic, and abstract works. Here is a link to an alternative view of this work looking directly downward on the model. 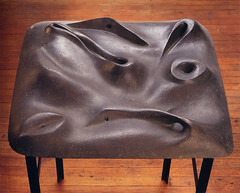 Archival photograph from The Noguchi Foundation, Inc..
Eyepopping delights the photography is just marvellous!